The plastic six-pack rings can severely damage marine life, as they tangle the wings of sea birds, warp the shells of sea turtles, and choke seals. Plastic pollution is a serious issue for the Gulf of Mexico, as it has one of the highest concentrations of marine plastic in the world. 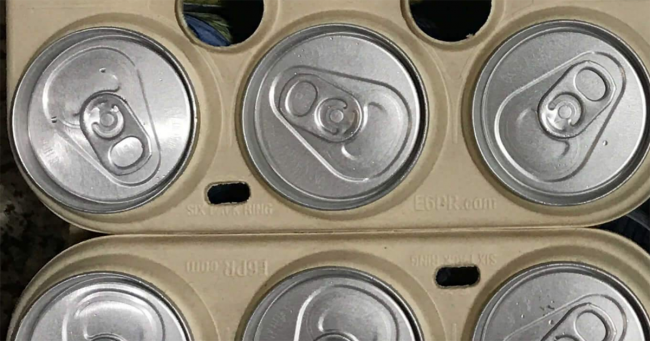 However, one brewery in Florida has a solution- bio gradable six-pack rings that can serve as a snack to wildlife, as they are made of wheat and barley. They look like they are made out of cardboard, but the wheat and barley byproducts have been compressed into a touch, durable material, which can sustain the usual wear and tear associated with transport and storage in a refrigerator. These rings were developed by Saltwater Brewery, a craft microbrewery in Delray Beach, with a startup called E6PR (short for Eco Six Pack Rings). They hope other breweries will purchase the new rings and help bring manufacturing costs down. Peter Agardy, head of the brand at the brewery, said that it is a large investment for such a small brewery created by fisherman, surfers, and people that love the sea, so Chris Gove, president of Delray admitted that they hope they will influence the big guys and inspire them to get on board. CBS News reported that the project was a collaborative effort between New York ad agency We Believers, Mexican biodegradable supplier Entelequia, and private investors from the beverage packing industry. Since they are made with “by-product waste and other materials,” these rings will be compostable when disposed of properly, and biodegradable if they end up being littered. The brewery is testing the rings with a group of craft breweries, but they won’t discuss specifics now. E6PR is one of the potential ways to turn the tide toward cleaner waters.